3-1/2 HP Briggs & Stratton gasoline engine. 8 inch inlet and outlet diameter. Cast aluminum fan and blower housing construction; spring mounted on skids. Less duct. Free Air Flow: 1561.6 CFM General’s line of portable air blowers can accommodate most non-hazardous confined space ventilation requirements. 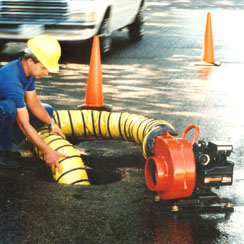 Select from 8 inch and 12 inch diameter units with power choice of gasoline, 12 VDC or 115 VAC. Both radial and axial configurations available for the most demanding air flow applications. There are no plastic frame parts to crack. Constructed with heavy gauge aluminum and steel. 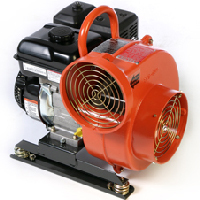 All General blowers offer laboratory certified air flow rates with independent, third-party testing.